This book, written and illustrated by Tupera Tupera, was so much fun to read in class, that I simply HAD to share. Polar Bear has lost his underwear! Where could it be? There's only one thing to do: Remove the book's underwear-shaped bellyband to find the missing pair! Is that Polar Bear's underwear? No, it's Zebra's—see the colorful stripes? The kids at school had a blast calling out animals to guess "Who's underwear is it?" It's a great way to introduce more animal names OR just to have some fun. Be ready for a loud and exuberant class, because this surely brings out the silly in them. 4-Stars for this great read-aloud! This classic story/nursery rhyme was always a big hit with my own kids, but I honestly wasn't sure how well it would work in the preschool ESL classroom. The language is not "easy" necessarily. I was pleasantly surprised though. The preschoolers really loved this story AND looking at the book. My only complaint is that this book is small (it's a board book) and the details are hard to see, especially when using it a read aloud for a large class. I used this book twice at school. Once for the large classes to introduce some farm animals. We focused on six animals: pig, duck, horse, cow, goat, and sheep. Game 1: I tossed farm animals around the room and asked students to go find them one by one. It's a very simple game, that the students enjoyed. There's something about a teacher doing something they're not supposed to do (throw toys) that tickles a preschooler's funny bone. Game 2: In Italy they call this game the "Box Game". Students crouch into a "box" position. Then I called an animal, and students came out of their boxes and made the correct animal sound. Game 3: Using my play parachute, one student crawled underneath and made an animal sound. The others had to guess the animal name in English. Whoever said the correct animal first (in English) got to crawl under the tent and make the next sound. I also used this book in my private afternoon lessons. These group lessons are much smaller and we use them to continue to practice and build on the vocab we introduce in class. For class, we used THERE WAS AN OLD LADY... and completed this fun craft which I found on Miss Thrifty SLP Blogspot. The students LOVED this. With these as a visual guide, the students were actually able to tell the story back to me (and their parents) at a very simple level. THE COLOUR MONSTER is a popular book, and for good reason. It is a great book to help kids look at and identify feelings. The version I used is the board book, which was perfect for my ESL kids. It introduces HAPPINESS, SADNESS, ANGER, FEAR, CALM, and LOVE. But otherwise, this version felt like it was missing something. For older kids or children at a higher level of English, the pop-up book version is gorgeous. Anna Llenas, the illustrator, has such a fun, unique style, and kids love watching it come to life in the pop-up book version. This week we're starting a new "unit" on feelings. And to delve into this perfectly appropriate topic for these preschool-age kids, I used a modern classic - TOBY'S SILLY FACES. If you haven't read this TOBY book, it tells the story of a little mouse (Toby) as he gets ready for bed. He and his father have a fabulous time looking into the mirror and making "silly" faces. In all, TOBY touches on the following emotions: silly, surprised, sad, scared, happy, worried, fussy, sneaky, and sleepy. While some of the words of this book are a bit challenging for new EL learners, what's really important is that it gets students hearing the adjectives for the feelings and offers lots of opportunities for you to stop and elicit the faces from them - which is the best part anyway. After reading and introducing our new words for the day (I focused 4 words- mad, sad, happy, and scared) each student was given one of the four cards above. I found this great free printable from Pocket of Preschool. The students had to find their classmates with the same "feeling", not by comparing cards, but by comparing their own sad, mad, scared, or happy faces. It took some practice, but once students got the hand of it, this was a riot! However, the next activity was even more fun! Before class, I downloaded four songs: one happy, one sad, one scary, and one mad. As I played the songs, students danced around the room acting out that emotion. The kids were hilarious! ​In case you'd like to try this out, these are the songs I used, all available on iTunes. Scared - "The Jaws Theme"
​Finally, we finished up the lesson with this feelings scissor and glue matching activity. It'll be filed away in Part 2 of their English Notebook which we give to the parents at the end of the semester. This week we continued our study of body parts— we learned head, arms, tummy, and legs. Teaching body parts is already so much fun, because there are plenty of opportunities for movement. However, pairing this lesson with THIS book made it even better. For anyone who hasn’t read I AINT GONNA PAINT NO MORE by Karen Beaumont and brilliantly illustrated by David Catrow, it tells the story of a child who loves to paint so much, he paints himself top to bottom, one body part at a time. 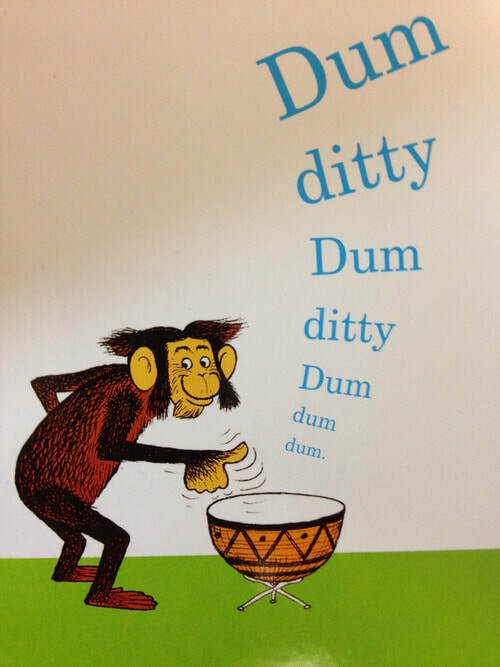 The story can be sung to the melody of “It Ain’t Gonna Rain No More”, which makes it an especially fun read aloud. A few suggestions. First, make sure you point out the illustrations on the first few pages and highlight what’s happening. (The mom confiscates all the paints, but the sneaky little boy finds them!) This will help the kids follow the story later on. Second, really get into it. This is one of those read alouds that could go terribly wrong in the ESL classroom, because it’s not a traditional “story” and much of the textual humor comes from the rhyming. However, the illustrations are absolutely delightful and tell most of the “story”. As long as you “act out” the book well, I’m certain your class will love it. Mine sure did! For our activities, we put together these cute animal puzzles from itsybitsyfun.com and practiced the words HEAD, TUMMY, and LEGS. I gave each student a piece of the puzzle and asked who had a head, tummy, legs and a tail, etc. Finally, the 4-6 year olds FLIPPED over this "My Monster" activity I created. As a class, we rolled dice to decide how many HEADS, EYES, NOSES, LEGS, ARMS, and FINGERS our monsters had. It was a great listening activity, and also good practice with numbers. The finished products are too cute! Looking for a fantastic read aloud to accompany your lessons about body parts? 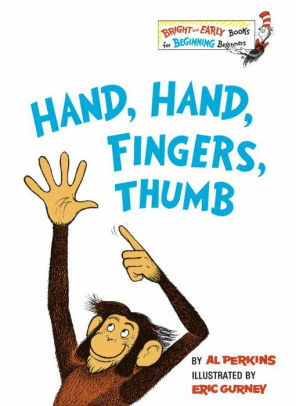 HAND HAND FINGERS THUMB by Al Perkins is the perfect book. This book was one of my childhood favorites, and it’s lost nothing over the last 30-odd years since I was a kid. My students asked to hear this over and over again— literally 7 or 8 times— and I happily abliged! After all, repetition is the key to learning. Suggestions - this book has a great beat. Get your students clapping, stomping, or drumming along. We followed this book with a FIND THE HAND game. I placed hands, thumbs, and fingers all over the floor, then called out a word. Students had to run and find the right picture as quickly as possible. With "i piccoli", we played a modified version of musical chairs, with the hands, fingers, and thumbs. For our paper activity which will eventually end up in their English journals, we made hand, finger, and thumbprints on this fun worksheet I made. ​I hope you have as much fun with this read aloud as I did! If like me you've been searching for the right picture book to accompany your lessons about shapes, your search is over. 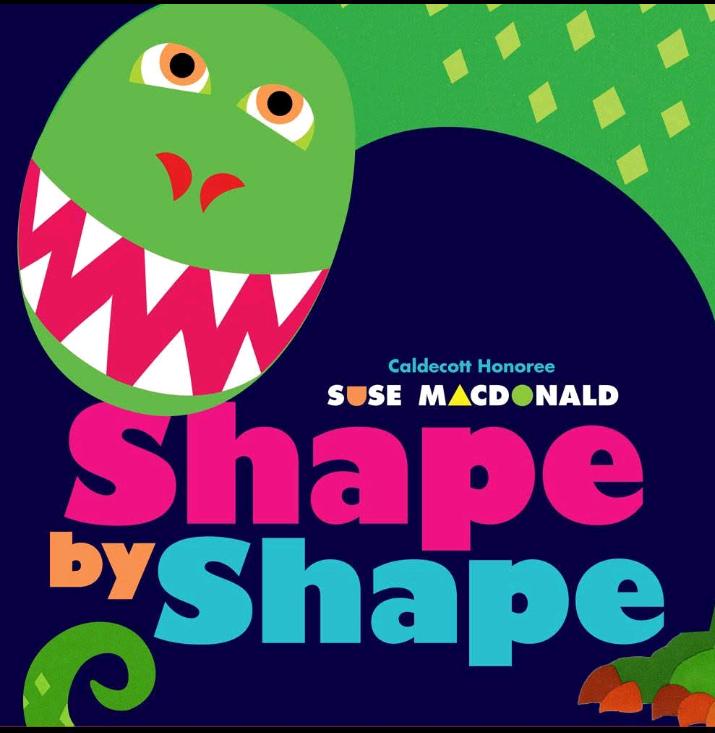 This ingenious book by Suse MacDonald is a real crowd-pleaser, perfect for introducing basic shapes in English. The book begins with a yellow page with two small black dots and the words, "Do you know what I am? I lived a long, long time ago..." With each page turn, new shapes are added to the picture so that the dots soon become eyes, then teeth, then a head, etc. Until finally, the whole body of the dinosaur pictured on the front cover is revealed. the book uses the following shapes: circle, triangle, crescent, semi-circle, oval, and diamond. Sadly, there's no square. I suggest hiding the cover if you plan to share this in your class. What's the fun of guessing what animal if it's already pictured right on the front? 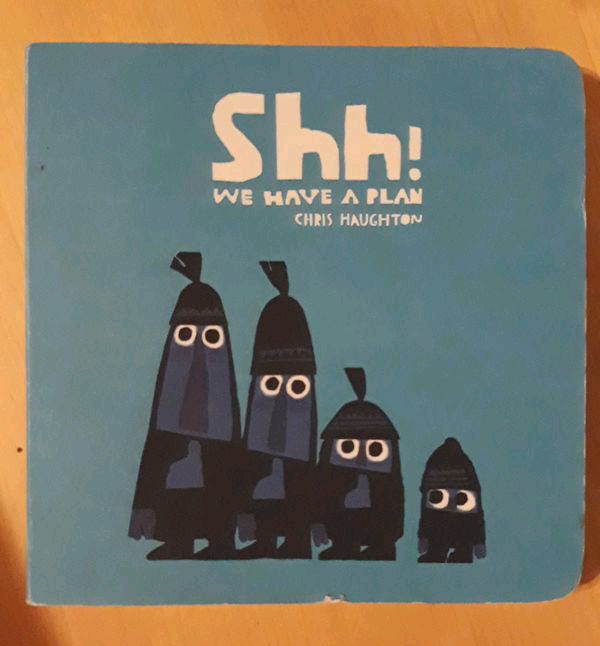 For anyone unfamiliar with SHH! WE HAVE A PLAN, run out or hop online right now and BUY IT! It is such a fun read aloud and perfect for the ESL classroom. 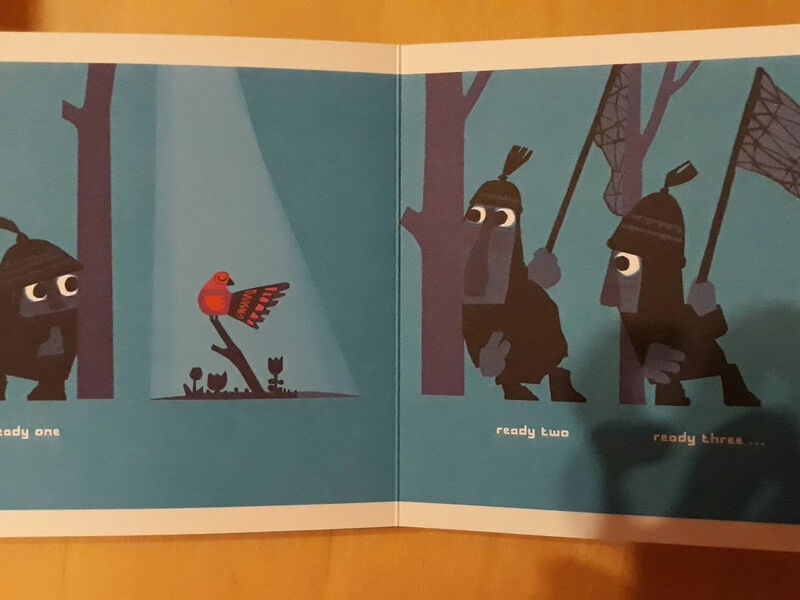 The very simple story of 4 (I've always thought they were brothers) out to catch a bird is told with simple, repetitive language even the youngest ESL learners can understand. It's great for introducing some action words : tiptoe, climb, paddle, run. It's great for learning basic "game" terminology- ready one, ready two, ready three, GO! And it's fantastic for getting ESL learners to repeat new words, because I can almost guarantee they'll be joining in with this story. Two very enthusiastic thumbs up for this book! Lately, a few parents have been asking me why I use so many picture books in my ESL lessons. Do the kids understand? And if they don't, what's the point? I have always believed strongly in using picture books to teach. Even in my high school classroom, I often used picture books to grab students' interest and to scaffold learning. Because people of all ages (0-99) love picture books. Even kids who "hate" reading light up when being read to from a great picture book. But at the preschool level, picture books are even more important. Do my 3-6 year olds "understand" the words? Most of them, no. But does a new, pre-verbal baby "understand" the words when a parent reads to them, speaks to them, sings to them? Not at first. However, listening lays the foundation for their language development. And the more they hear, the more they learn. It's the same in the ESL classroom. That's why I'm happy to read, read, read. I believe the kids "understand" much more than we realize, and even if they don't, their brains are learning what English sounds like. Their brains are being wired to learn. And the more they hear, the more connections they will make. And for those skeptics out there, here's a picture book (what else?) to prove my point. This brilliant picture book tells the story of some bugs who discover a mysterious plant. As it grows and grows, they decide to make a tree fort. The clincher? The entire story is told in a made-up bug language. But thanks to the pictures (and a child's understanding of how language works) the story is easy to follow. And not just that, it's a joy to follow. So read, read, read, whether the kids "get it" or not. Because you're doing something even more than teaching vocabulary. You're teaching "language".